Meaghan: Before I even had a chance to slip on the Brooks Ricochet, someone (“cough” Dave Ames “cough”) told me I’d hate this shoe. So, I laced up my Ricochet’s with little to no expectations. Good news: I didn’t hate them. I’ve got a few (honestly though, not a ton) of nice things to say about this shoe. Let’s dive in. 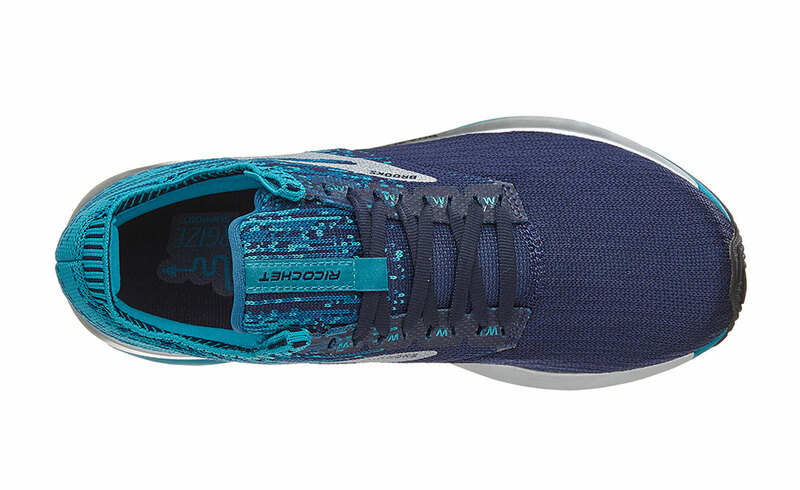 The Brooks Ricochet is an everyday trainer with a soft knit upper and decent cushioning. The upper is designed with a 3D circular knit that works to “flex and hold the foot strategically as it moves.” I have to say, of the knit uppers I’ve been rocking, this one wins for the balance of stretch and support. I never felt like my foot was sliding around, as I have with other knit uppers. The suede heel tab and wrap-around heel collar add to the comfort. The midsole is designed with a blend of the new DNA AMP cushioning and the BioMoGo DNA. If you must know: “DNA AMP is made from a soft, naturally expanding foam encased in a skin that resists horizontal expansion. 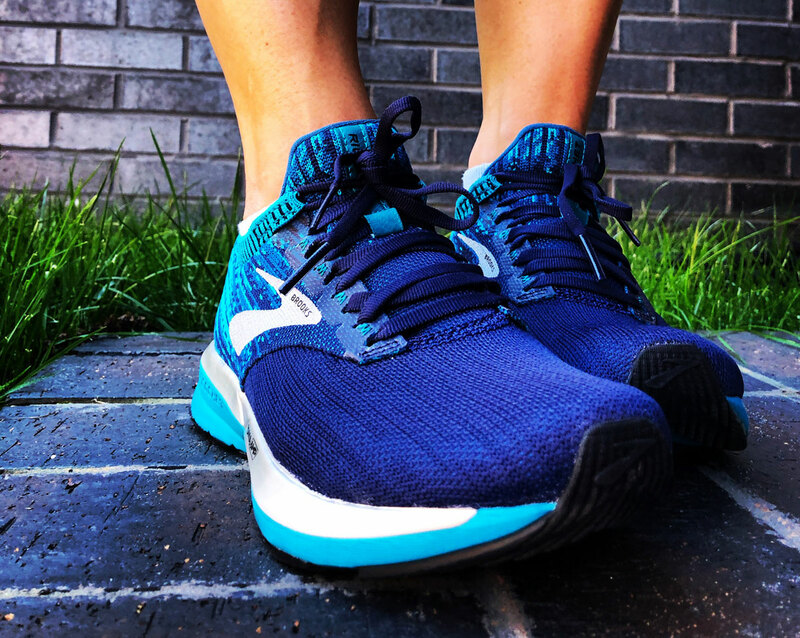 The energy captured from the force of each stride is directed back up to you, resulting in a bouncier and springier feel mile after mile after mile.” In my opinion, this shoe feels slightly firmer than a traditional everyday neutral trainer. 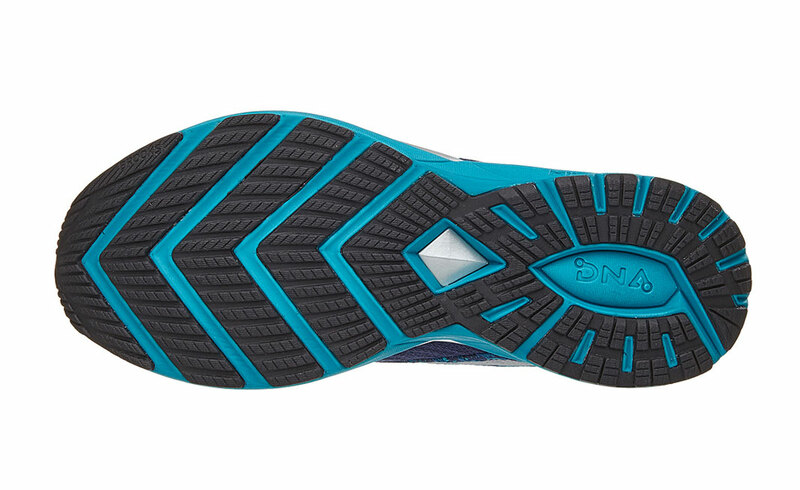 The outsole has an arrow point design with thin rubber placements for added durability and traction. I had no issues on wet roads and sidewalks. 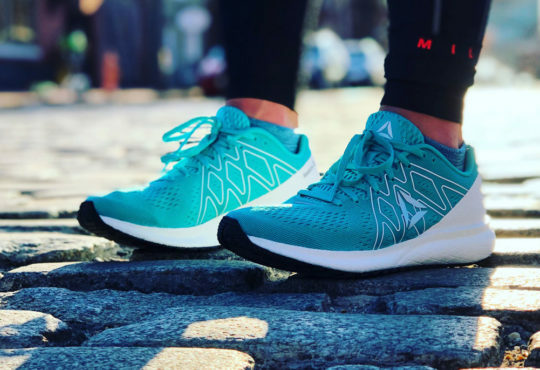 Erin: When Brooks released the Levitate last year, I was very interested in trying out a shoe that had spent years in development and was touted as having more energy return than any other shoe on the market. While the Levitate was extremely comfortable from a step-in standpoint, it was stupid heavy, and I didn’t feel the energy return at all. I thought maybe that was due to the weight of the shoe negating any energy return properties of the AMP midsole. 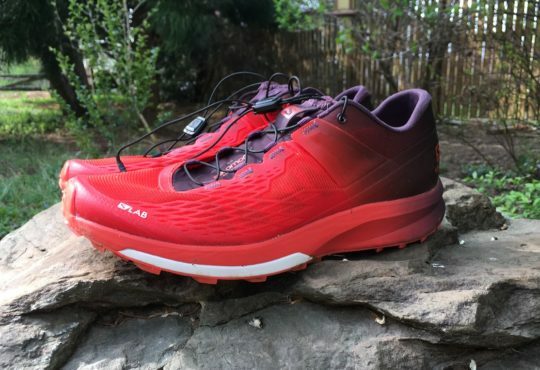 I attended a Brooks event at my local running store this summer and spoke to a Brooks rep about the Levitate; he told me that Brooks was going to be releasing two new models with the DNA AMP midsole in the fall: the Bedlam would be a stability option, and the Ricochet would be a more performance-oriented shoe. When Thomas told me I would be getting the Ricochet to review, I was pretty pumped and hopeful that it would be what the Levitate was not. The Ricochet, surprisingly, is not that much lighter than the Levitate on paper (9.2 oz versus 9.9 oz), and still felt a bit heel-heavy when I pulled them out of the box. On, however, they do feel lighter than 9.2 oz, which is still pretty hefty for a neutral trainer and places the shoe out of the performance category (for me, anyhow). Rather than creating a midsole entirely of DNA AMP TPU (as in the Levitate and the Bedlam), Brooks used both the TPU and a layer of BioMoGO EVA to shed some weight. Does this sacrifice some of the potential energy return? I’m not sure. I don’t feel any more or less energy return in the Ricochet compared to the Levitate, but I definitely do prefer the Ricochet. I will say that in general, I am not a huge fan of the look of most Brooks shoes. I did like the Levitate, however, and I love the look of the Ricochet (it looks almost identical to the Levitate 2). Brooks did a great job with the look and feel of the Fit Knit upper; it is secure and breathable. The knit heel collar comes up a tad high and has no padding whatsoever, which didn’t bother me (except for one point that I’ll address) but is something to keep in mind. Austin: Between the Levitate 2, Bedlam, and Ricochet, the Ricochet is the lightest model at 10.2 ounces in a men’s nine (which still skews heavy in my assessment). I knew the uber comfortable FitKnit upper would lower the weight for all three of the aforementioned models, but despite this fantastic upper, it seems clear that DNA AMP adds weight in spite of the perception that it’s a lighter weight compound. Unlike the Levitate 2, which is fully comprised of DNA AMP, the Ricochet (and Bedlam) uses DNA AMP and the well-liked BioMoGo DNA. I noticed the softness of the BioMoGo during multiple runs, further buoyed by the responsiveness of DNA AMP. In short, the Ricochet exhibited a springiness at faster paces. Step-in comfort is solid, and I can’t say enough about how much l like the FitKnit upper. 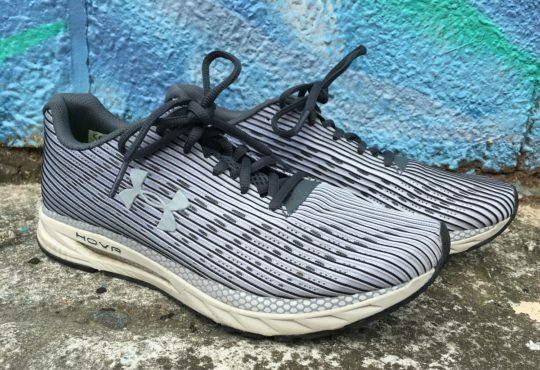 I thought this upper might create more lateral forefoot movement as overlays of varying degrees of length and thickness keep the feet more secure, but my feet were locked in every mile. Almost. Meaghan: I noted earlier that the Ricochet feels a bit firmer than an everyday trainer. It’s not my favorite underfoot feeling for easy miles. It’s also rather heavy (when you compare it to other viable options). I can’t say that I will be picking out the Ricochet over my Kinvara 10 or OG Clifton 1. You just can’t beat lightweight cushioning. Erin: I’m having a hard time trying to articulate my feelings about this shoe. At first, I really liked it. Or maybe I really wanted to like it. But the more I run in it, the more confused I am about it. If you read the description on Brooks’ website about the Ricochet, you’ll end up expecting way more than the shoe delivers. It fits well, and is durable (and likely to last many, many miles), but…there’s just no performance aspect whatsoever. They aren’t responsive. There’s no snap. I raced a 5K in them and ran an embarrassingly slow time that I don’t feel is representative of my current fitness level (I was hoping for a PR, TBH). Obviously, I can’t blame that entirely on the shoes, but I do feel they contributed. When I first received these and had a few runs on them, I was somewhat disappointed that I hadn’t received them earlier, because I thought they would have made a good marathon shoe. Now, after 50 miles, I’m glad I didn’t. One significant issue I have with these is the lace loops, where the ankle collar is folded back on itself creating loops for the laces (I guess to create a heel lock?). They are very noticeable and stiff, and even with lacing below the loops, I can still feel them pressing into the tops of my feet. It is very irritating, and I don’t really understand the purpose of them. I’ve tried different socks, lacing the shoes more loosely…nothing helps. Austin: Unfortunately, the Ricochet will not escape this review unscathed. The FitKnit upper is a great fabric, but I didn’t like the lacing arrangement at the midfoot. The thin eyelets and loop on the top of the tongue make it challenging to cinch the shoe tight (although my narrow feet don’t help matters). I don’t care for the heel wrap either, a feature also included in the Bedlam and Levitate 2. From a design standpoint, it’s sleek and trendy; however, from a functional standpoint, there’s some lateral give. The minimal heel padding and internal heel counter on the Ricochet created some blisters on both feet too. Again, this may be the consequence of narrow feet, but I’d rather not wear two pairs of socks to accommodate the shoe’s characteristics. The shoes should conform to my feet, thus the disconnect with the overall fit. Meaghan: The Brooks Ricochet is a solid daily trainer. While I don’t love it, I certainly don’t hate it. I also ran a couple marathons in the past few weeks so my mileage in between has been short and slow. For those types of miles, I prefer a softer cushioning underfoot. 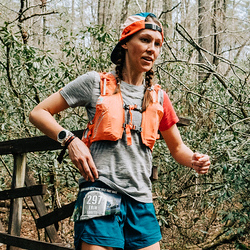 If you haven’t irrationally run two marathons in the past few weeks, or prefer a firmer ride, check these out. 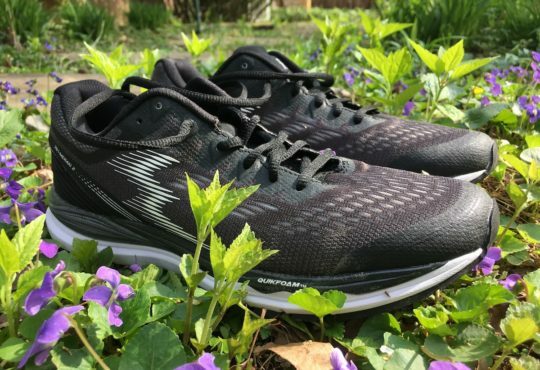 Austin: Before penning this review of the new Brooks Ricochet ($119.99), I pondered many viewpoints as it’s a unique shoe to categorize in their robust lineup of daily trainers. The best place to begin, I suppose, is to highlight the fact that the Ricochet is the third model that features DNA AMP, a midsole that, according to Brooks, provides the highest amount of energy return. I set out—obviously on foot—to see how it fared against the other two. If you need (or want) a new trainer and desire a little more spring than the popular Ghost, have a look at the Ricochet as it shares the same price point. 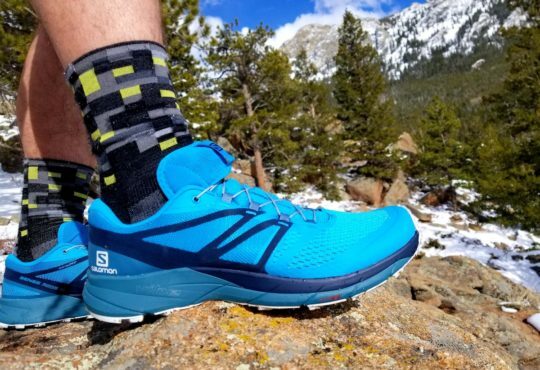 The FitKnit upper, svelte design, appealing drop (8-millimeters), and responsive ride courtesy of DNA AMP and BioMoGo make for a strong package. 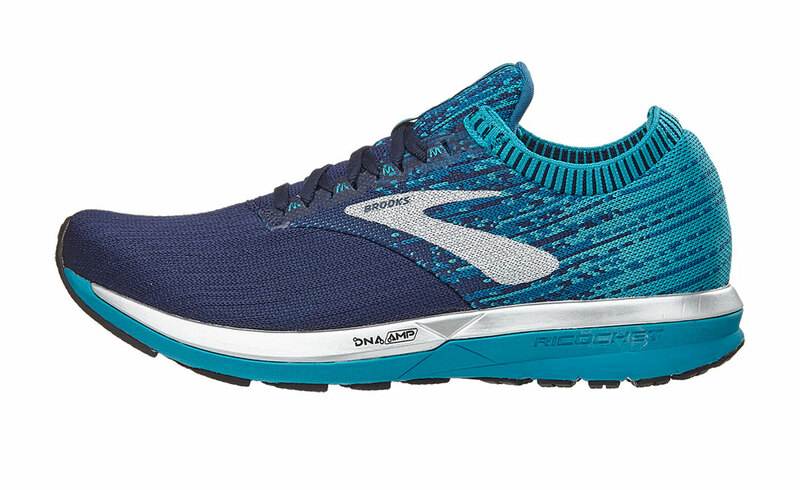 Given the Ricochet and Ghost, I personally prefer the Ghost’s softness, and I credit another new Brooks midsole innovation for that cozy underfoot feeling: DNA LOFT. 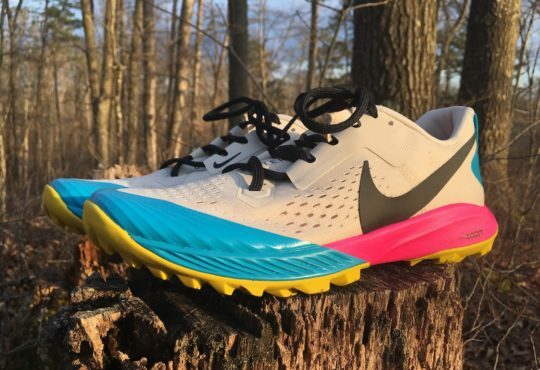 Speaking of LOFT, I’m now curious if Brooks is developing a shoe in the lab that combines DNA AMP and DNA LOFT with a 4-millimeter drop to shed some weight? 2019 is around the corner. I’m not sure of a name though. How about Reverb or Recoil? 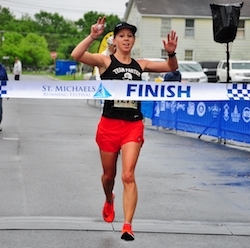 Meaghan is the co-founder of Big Run Media and Believe in the Run. She’s often found tearing up the promenade on Baltimore’s waterfront early in the morning.